Was scouting a place for Deer hunting in the north country when I came across this on Wednesday. I was about 1.5 miles from my truck when I found it.The porcupine did not do much damage to it. Awesome find! Any size reference? This is actually a very good size shed. A friend of mine who is a guide was asking about the width of the shed. I told him it was about 12 inches wide at the widest spot in the palm and he said that that was a really good one. I have not put a tape to it but will do so this weekend. I was real happy to stumble onto this. 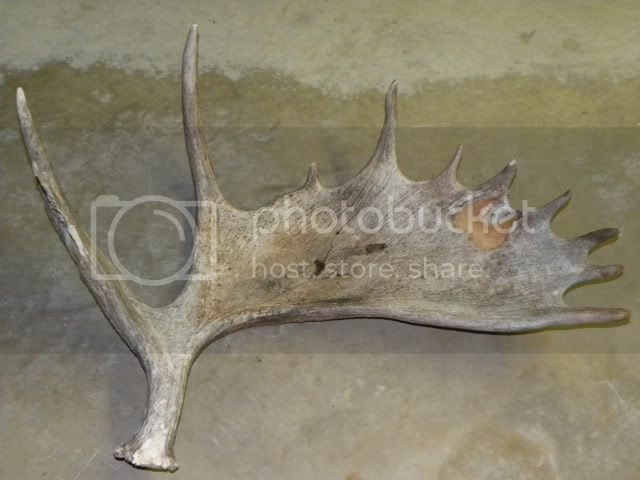 Nice shed.... Good find I'll be in Northern NH in a couple of weeks looking for some moose sheds.